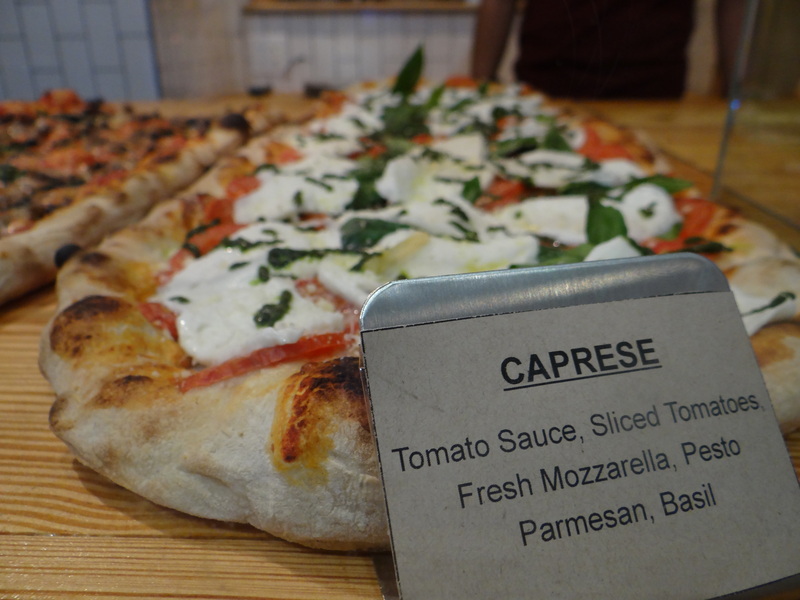 Summary : A new take on Neapolitan pizza, this spot serves slices on the Bowery until 4AM. 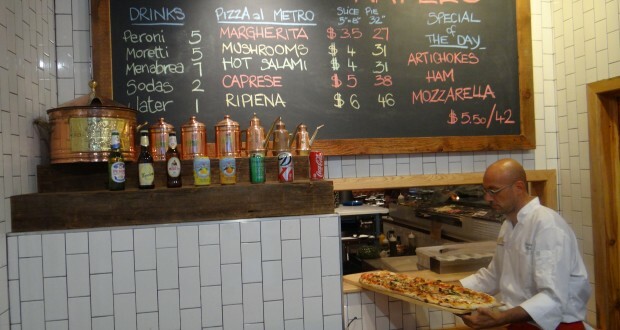 It's an offshoot of Forcella and as good as the pizza served there. Now you can enjoy it in smaller quantities. A Slice Of Naples (334B Bowery) officially opened to the public last Thursday and I had the opportunity to swing by for a tasting the night before. The place is owned by Giulio Adriani — the man behind Forcella — and A Slice Of Naples is actually attached to the Forcella Bowery location. The Neapolitan pizzeria was always a bit of an awkward space with a small seating area upfront and then a larger seating area in the back. Adriani has replaced the front area with this take out shop — a smart decision on his part. First off, A Slice Of Naples will be open until 4AM daily — generating revenue from a space which was previously closed after dinnertime. 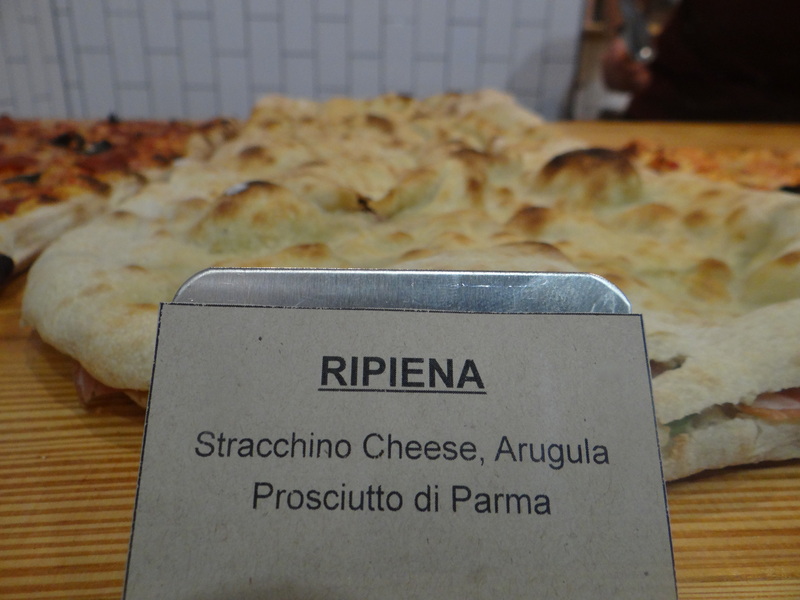 Second, Adriani is once again putting a new spin on the New York City pizza scene. Back in 2011 when the first Forcella location opened, he introduced us to the Montanara pie — a Neapolitan pie where the dough is fried before it is cooked. 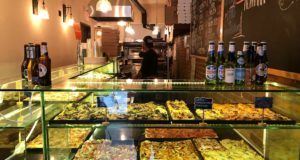 He opened a place the following year which only sold Montanara pies, but it shuttered quickly (Montanara pies are still available at Forcella). Now he is bringing us what I believe to be Manhattan’s first Neapolitan slice joint. Technically speaking, the slices for sales aren’t exactly Neapolitan, but I’m calling them that because the differences between a slice of a typical Neapolitan pie and the pizza from A Slice Of Naples are subtle. The pies at A Slice Of Naples are called Pizza al Metro (pizza by the meter) and they are cut into square slices where they cost anywhere from $3.50 to $6.00. Whereas traditional Neapolitan pies are cooked in a wood fired oven, these pies are cooked in an electric oven. Doing so allows the pies to cook a little more slowly to evaporate additional water which is added to the dough. As of now there are five pies on the menu + one rotating special. 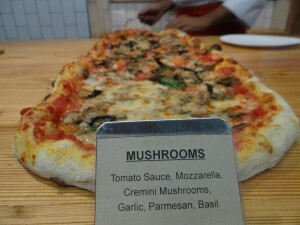 The Margherita and the Mushroom pies were both solid. 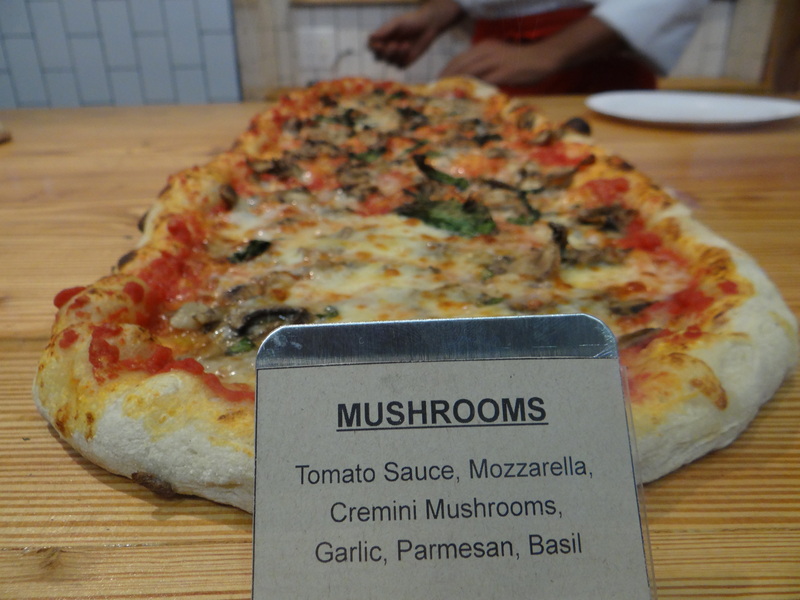 The Margherita reminded me of Forcella’s Margherita pie and on the Mushroom pie the cremini mushrooms were cooked to perfection along with some garlic. 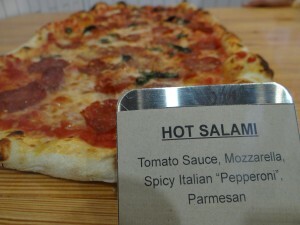 Next up was the Hot Salami which featured pepperoni — again nothing too fancy. Just solid, good pizza. 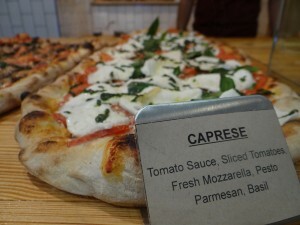 The Caprese and Ripiena were the most unique pies on the menu. 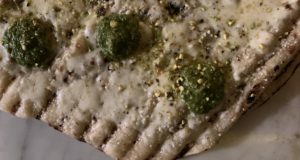 The former contains mozzarella which is put on post-cooking and it tastes as if you’re eating a tomato and mozzarella sandwich with a hint of pesto. To create the latter pie, the dough is cooked in the oven without toppings and then sliced open and filled with arugula and prosciutto — an actual sandwich! I liked them both. 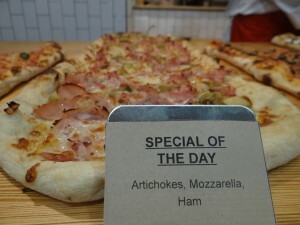 Finally, the special for the day was a pie with artichokes, ham and mozzarella — my least favorite of the night. 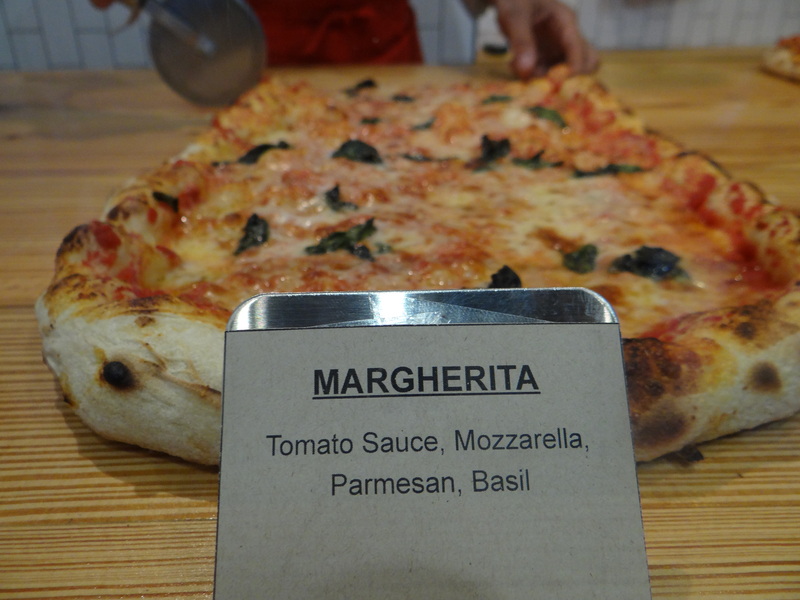 When New Yorkers are craving a slice of pizza, I wonder how often it will occur to them that instead of a greesy corner slices that they can pop by this shop for an upscale Neapolitan slice. It certainly isn’t as filling as, say, a slice at Artichoke which is similarly priced at $4.00-$5.00. But you also don’t feel gross after eating it. I’m also curious whether these meter long pizzas will become a popular delivery option for families and businesses in the area. 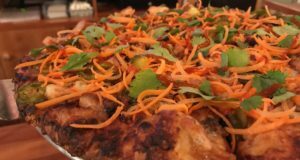 Full pies start at $27 and can potentially feed six people. That breaks down to $4.50 a person. If you consider that a pie in Manhattan is normally priced around $18 and feeds 4 people than economically both options are the same. I’ve always liked Forcella and if A Slice of Naples was a little closer to my apartment I could see myself going there on occasion. 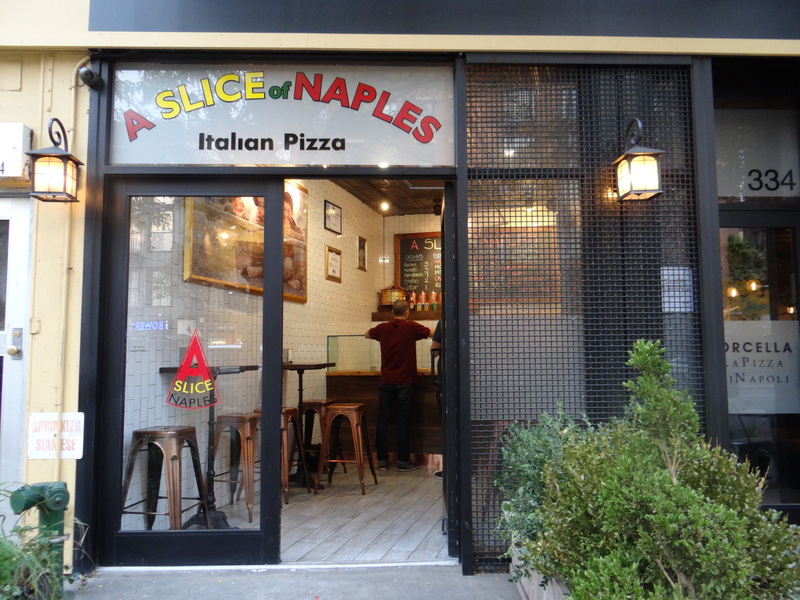 There aren’t many slices in the immediate vicinity of A Slice of Naples so it’s possible that they can capitalize on their location. If it’s successful, maybe we’ll see A Slice Of Naples attached to all of city’s Forcella locations. The most noteworthy pairing since the combination Pizza Hut and Taco Bell.